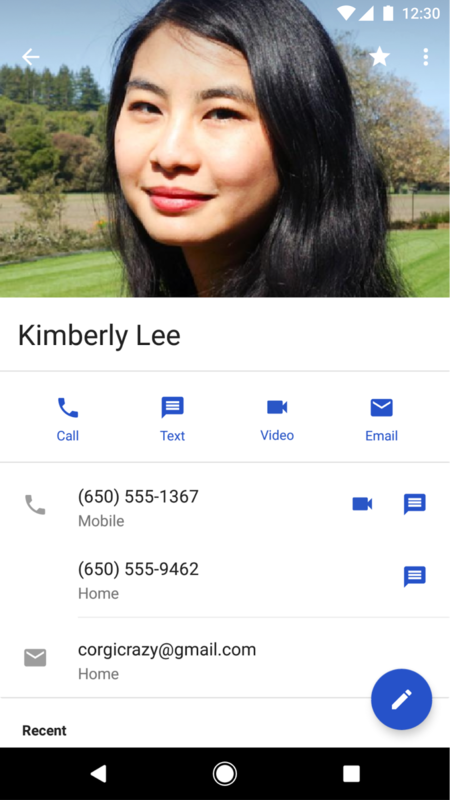 Large photos are back: A popular request from G Suite users, we’ll now display a larger, more vibrant contact photo. Action buttons under the photo make it easier to connect: Under the contact’s name, you’ll now see new buttons to call, text, video chat or email that contact. Additionally, if there’s at least one street address in the contact’s info, a Directions button will appear. Directory card shows directory profile information: In this card, you’ll see things like the contact’s job title, work phone number, manager name, and office location. 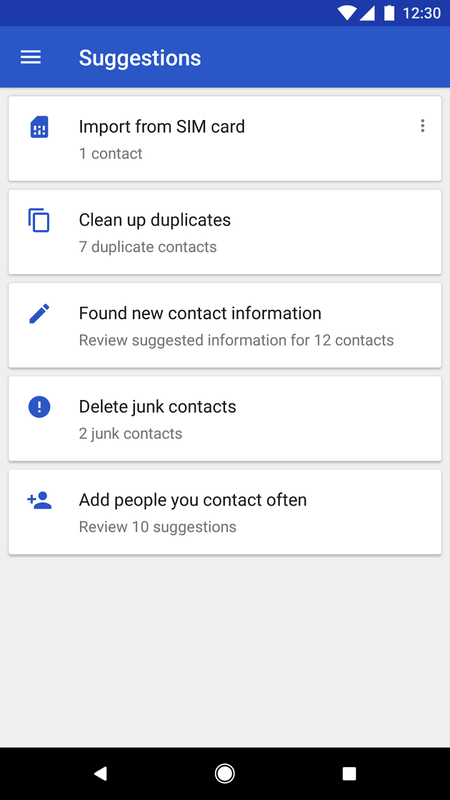 Suggested contacts to add: New in this release, you’ll see suggestions to add contacts you frequently communicate with across Google’s products. These appear under the “Add people you contact often” summary card. Merge all duplicates: The duplicates suggestion view now has a “MERGE ALL” button which allows you to accept all duplicates suggestions at once. 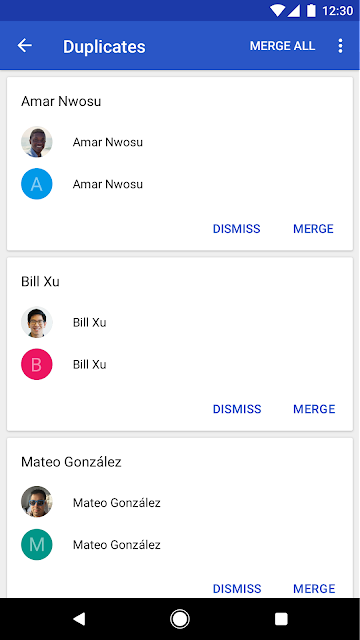 Lastly, you can now customize the “Contacts” list view to show just the labels you want. This is accessed via a new menu item in the main list screen called “Customize view.” This feature was available in previous releases for the “All contacts” list view, but it has now been made available for individual accounts as well. 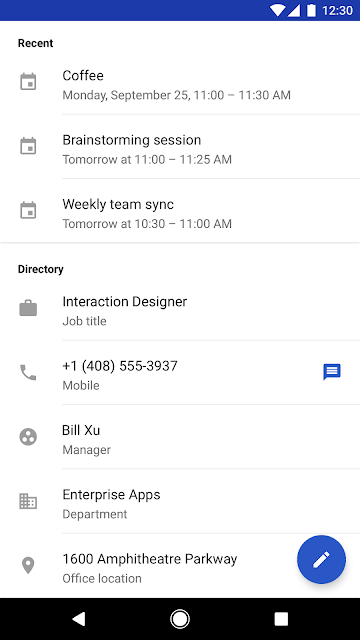 We hope these changes make managing your contacts simpler and more efficient. For more information on using Google Contacts, please visit the Help Center. Today we’re releasing version 2.2 of the Google Contacts app on Android. This release contains several changes to the look and management of your contacts. Read on for more information.